Four days before Christmas in 1943, a badly damaged American bomber struggled to fly over wartime Germany. At its controls was a twenty-one-year-old pilot. Half his crew lay wounded or dead. It was their first mission. Suddenly a sleek, dark shape pulled up on the bomber's tail—a German Messerschmitt fighter. Worse, the German pilot was an ace, a man able to destroy the American bomber with the squeeze of a trigger. What happened next would defy imagination and later be called the most incredible encounter between enemies in World War II. 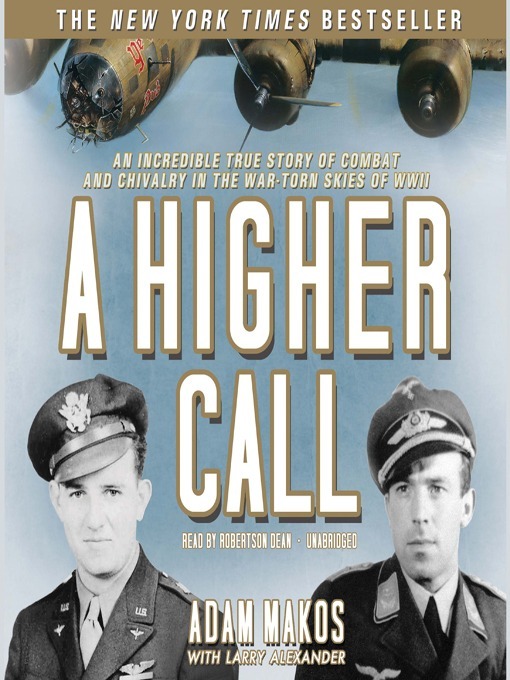 A Higher Call follows both Charlie and Franz's harrowing missions. Charlie would face takeoffs in English fog over the flaming wreckage of his buddies' planes, flak bursts so close they would light his cockpit, and packs of enemy fighters that would circle his plane like sharks. Franz would face sandstorms in the desert, a crash alone at sea, and the spectacle of one thousand bombers, each with eleven guns, waiting for his attack.